Ok! I'm melting!!! I arrived home today (after a hair appointment, manicure and pedicure – life is tough) to no power and no lifts. I decided to take a stroll to the university markets up the road. What was I thinking? It's over 40 degrees!!! So now I've blown my diet and am sitting in Starbucks drinking iced tea using the portable USB rechargeable fan I purchased in desperation. 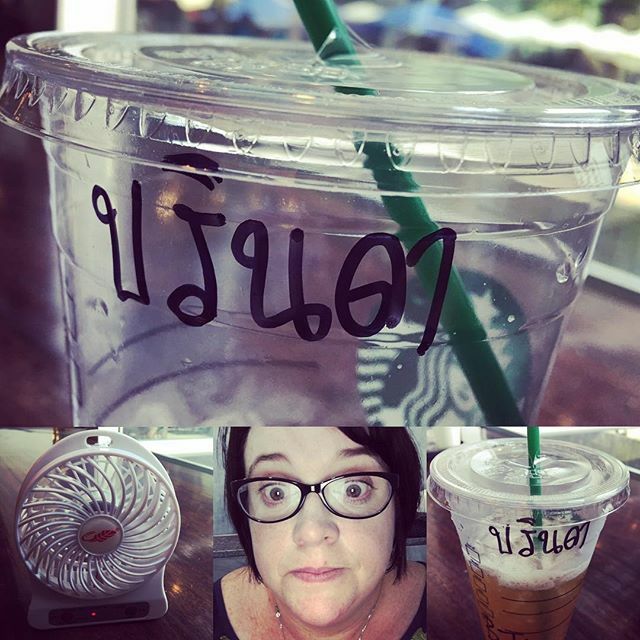 I'm not sure what is written on my Starbucks cup in Thai. Probably – crazy red faced foreigner with fan!! I must look ridiculous And now I get to walk home ……. Previous Previous post: The most amazing antique/vintage shop EVER! I couldn't breath I was so excited!!!!!!! !